As you gaze at the dreary grey skies and a weather forecast of rain you might ask yourself, “self, I bet you can’t name one good thing about winter.” We can. Rugging up in soft, cosy knits like the beautiful work from Wool and the Gang. Wool and the Gang isn’t your run of the mill jumper designer. Founded by some fashion heavy hitters who are alums of the likes of Alexander McQueen, Balmain and super elite Central Saint Martins fashion design school, Wool and the Gang designs contemporary knitwear in colours and shapes that have the fashion zeitgeist chasing after it. The company attempts to revive the tradition of craftspeople, collaboration and community. You can buy its designs in two ways: ready made by hand by a gang of knitters somewhere in the world, or as a kit with everything you need to make the something special yourself. For the fashion forward knitter, Wool & the Gang is the antidote to a massive universe of old fashioned knitting patterns. 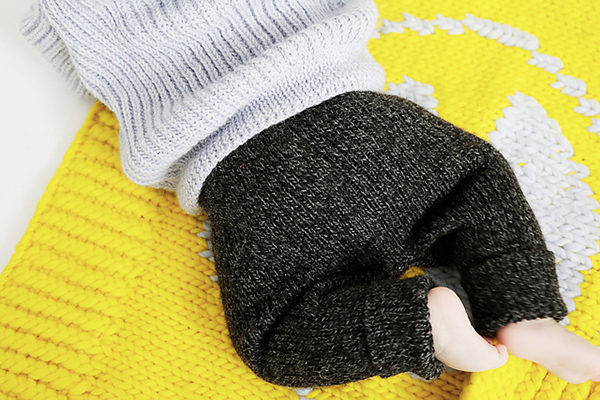 Wool & the Gang for kids has lots of beautiful pieces like jumpers, soft toys, blankets and rompers. You can sort the offering by difficulty level or material, or you can gobble up the whole collection at once. There are cosy pieces like the Lazy Day Leggings ($99 ready made/$47 knit your own) made from a deliciously soft Merino/alpaca yarn. If you have trouble picking a colour, we won’t be surprised. In our humble opinion, purple haze is the most snuggly of hues. For the more skillful knitter, there’s the striped Merci Cardigan ($75 ready made/$65 knit your own) that lets you try your hand at colour work. If you don’t knit, buy the cardie ready made and admire the handiwork of an artisan from the Peruvian Gang based on the outskirts of Lima. If you don’t have kids, don’t let that deter you from the delights of Wool and the Gang. There are sweet sets like the Oh Baby Set ($88 ready made/$30 crochet your own) that has a hat, bib and booties. Part of the proceeds from this set go towards Every Mother Counts, a charity whose mission is to make pregnancy and childbirth safe for every mother, everywhere. Can your little niece or nephew say “best auntie ever”? Once you’ve mastered knitting for the squids, Wool & the Gang has a huge selection of fashion forward knits for women and men too. Orders ship worldwide for $10, or $33 for the super speedy option.